The fitness industry in the Middle East comprises of more than 15,000 registered professionals across more than 500 venues. As the industry grows and as a way to validate the excellence of professionals in the region, we would like to recognise and reward those that have made this industry a success across all the diverse health & fitness segments. The 2018 FIT Awards which is now in its 5th edition, had a total of 20 categories. Building on the success of previous years the event introduced 4 new categories. This award will acknowledge the importance of the role of the personal trainer within the fitness industry. It recognizes individuals who are REPs registered, with a minimum of one-year experience working in the UAE, who spend at least 15 hours per week actually training clients one on one. They are able to inspire his/her clients to personal growth and a higher level of fitness. Shortlisted finalists will be required to provide details of their experience and skills, achievements to date, and their commitment to his/her clients. This award recognizes an individual who is a REPs registered group fitness Instructor, with a minimum of one-year experience working in the UAE, and teaches a minimum of 5 group classes per week. Paramount traits include superior instructional abilities and influence as an instructor to motivate and inspire people to commit to group fitness. You will be required to provide a CV as well as be able to describe how you inspire others and make a difference in people’s lives. This award recognizes an individual who is a REPs registered Instructor with a minimum of one-year experience teaching in the UAE and conducts a minimum of 5 Group Pilates/Yoga/Mind & Body Classes per week. Paramount traits include superior instructional abilities and influence as an instructor to motivate and inspire people to commit to group fitness. Shortlisted finalists will be evaluated on their class delivery, which will focus on a number of factors pre, during and post-class and their achievements to date. This award recognizes an individual with a comprehensive understanding of the fitness industry who goes above and beyond in his/ her role as a leader and manager. This category is open to all Fitness Managers from studios, small-large clubs, hotel clubs, franchised and stand alone clubs. You will be required to show evidence of how you motivate and inspire your team, handle customer relations, continue to educate yourself and your team and help ensure retention and profitability of your club. General/ Club Manager of the Year. This award recognizes General/ Club Managers who go above and beyond in his/her role as a leader. This category is open to all Managers from studios, small-large clubs, hotel clubs, franchised and standalone clubs and applies to those that manage a single facility/club. If shortlisted, finalists will be required to show evidence of how they have met customer demands, handled customer complaints, motivate and inspire their team, processes and initiatives they have implemented and more. This category serves to reward an individual who is REPs registered and has only been working within the fitness industry as a personal trainer for less than 2 years and demonstrates passion, commitment and dedication to their newfound profession. Candidates must spend at least 15 hours per week training clients one-on-one, walks the talk inspiring his/her clients to personal growth and a higher level of fitness and health. This award recognizes a social media influencer who has been able to make a positive impact on the lives of others. These figures are expected to help guide change in their fan’s fitness and nutrition goals. Other important factors the public should consider when voting include number of followers, fan engagement and positive brand collaborations. A Sport360 panel will be selecting the nominated finalists. This category is for small-medium gyms with a maximum membership of 2,000 members or less. This could be hotel clubs, standalone facilities and must be part of a franchise. Your club will have demonstrated excellent progress in areas such as – but not exclusively – member recruitment and retention, staff training and expertise, customer satisfaction, services provided and what makes you stand out from the rest. In short, you will have a club to be proud of and you’ll want everyone to know about it. * What we consider a franchise is any business in the Middle East containing more than one facility. This category is for larger Clubs with 2,001+ members or over. This could be a specific branch of a franchised club, standalone clubs or hotel clubs. Shortlisted finalists will stand out from all the others and need to demonstrate excellence in areas such as member recruitment and retention, staff training and expertise, customer satisfaction, services provided, USP and more. * What we consider a franchise is any business in the Middle East containing more than one facility. Open to small specialty/boutique facilities offering a specialised experience with either no annual membership or a maximum of 1,000 members. Judges will be looking for evidence on areas including; what makes your business unique, your marketing strategy, attention to detail, customer experience and workout objective and outcome. This category is open to all studios that are primarily dedicated to delivering Yoga, Pilates or Mind & Body classes and services. If shortlisted, you will be required to show evidence of your timetable, the facilities available for members, an overview of any workshops or initiatives your studio hosts, your teaching staff and what makes you stand out from the rest. This category is for gyms, which are standalone facilities that are not group owned. Your gym will have demonstrated excellent progress in areas such as – but not limited to; member recruitment and retention, staff training and expertise, customer satisfaction, services provided, expansion plans and what makes your club unique. This category is for restaurants; cafes and independent suppliers who offer healthy nutritionally sound foods, products or meal plans. You will offer a good range of products, be able to show suitable product availability and be able to demonstrate knowledge of nutrition and healthy eating, ideally sharing this knowledge with your customers. This category is open to organizations and/or their agencies that delivered effective health and/or fitness brand, retail, or product activations. Judges will look for evidence of uniqueness, post launch success demonstrated through quantifiable reach and impact on target audience in terms of brand awareness, market share, increased sales and behavioral change measured against original objectives. This category is open to all brands, with a presence in the GCC market, that sell fitness products/services. Fitness products/services may be the brands primary focus or simply an arm of the company. The winner of this category will be fully determined by a public vote. This category is open to organizations and/or agencies that delivered an effective health and/or fitness event. Judges will look for evidence of uniqueness, pre & post launch success demonstrated through quantifiable reach and impact on target audience in terms of brand awareness, market share, increased sales and behavioral change measured against original objectives. We are looking for facilities, which provide guests and members with the very best in health and spa experience. You will need to provide details of how you stand out from the crowd, from your staff selection through to the spa products you use, ambience and décor of your facility and how you balance the interests between returning clients and one off experiences. This category acknowledges the importance of continuing education for the fitness professional’s career development and growth. This Award will recognize the organization which best demonstrates a commitment to quality training, learner support and strives to drive professionalism within the industry. Shortlisted organizations will be required to submit a detailed submission outlining the learner journey from start to finish. Submissions/nominations will open on 1st September 2018. Please email [email protected] or [email protected] if you wish to receive a submission form. Public voting will open on the website on Tuesday 16th November 2018. The FIT Awards Judges will make the final decision on the category winners based on the highest scores within each category, the process for which will be overseen by independent auditors. Winners will be announced at the FIT Awards Gala Dinner on Wednesday 5th December 2018. Please note the categories Fitness Brand of the Year, Influencer of the Year & Health Food Operator of the Year will be entirely decided by a public vote. How long do I have to have been working in the UAE to qualify for entry? Is there a fee for entering any of the award categories? There is no fee for entering any of the individual categories (Personal Trainers, Instructors, etc). For the facility/business categories, there is an entry fee of $175 per category. This must be paid prior to October 25th 2018. All entry fees must be paid by credit card. How will I know if I am selected as a shortlist finalist? You will be contacted directly. 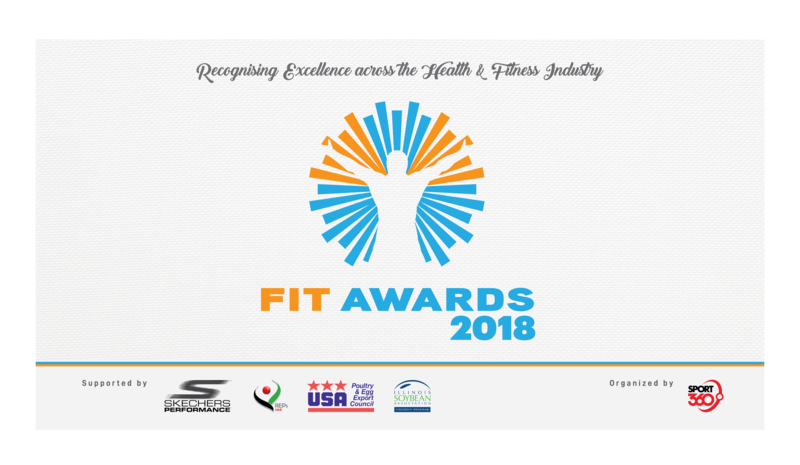 Shortlisted finalists will also be announced on the FIT Awards website on November 8th 2018. Can I submit new information to my application once I have entered? No, as judges may have already reviewed your application. Yes, as long as you meet the criteria for each category you are entering. You will need to complete a separate entry form and pay a separate entry fee for each category that you enter (where applicable). Must the entry/entries be in English? Do I have to be an entrant or finalist to attend the Awards gala evening? Every and anyone is welcome! In fact most attendees are going to see who will win, network with their industry peers and have a good time. Who are the judges and how were they selected? The judging panel for all categories is made up of industry experts chosen for their skills and experience within the exercise industry and internationally. They will not be revealed until the evening of the Awards. No members of the Sport 360 team are on the judging panel or part of the judging process. The judging procedure follows a rigorous process. To ensure absolute transparency and integrity there will be an independent auditor present throughout the judging responsible for the handling and securing of all written materials relating to the results, for compiling the score reports and certifying to the accuracy of the scores within the report. All judges sign a confidentiality agreement. i.e. Any information (including financial and membership figures) disclosed to them during the judging process remains completely confidential. Whilst individual written feedback is not possible, if the judging panel feels there are themes that can be highlighted to all entrants this will be communicated to them. Can I change or withdraw my entry after it has been submitted? Will I get a refund if required? No. The FIT Awards only issues a refund when the submitting company has overpaid or has been incorrectly charged. I would like to submit an entry but the data corroborating its success is highly confidential. What can I do? Security and confidentiality are of paramount importance to the FIT Awards. All data and entry materials will be treated with the utmost confidentiality by the judges and management. All entries are stored in a secure place away from non-authorised personnel and shred after the Gala evening. Judges and those present throughout the judging are required to sign a Non Disclosure Agreement. The Awards ceremony took place on Wednesday 5th December 2018 at the Movenpick, JBR. The evening commenced at 7:00pm with the cocktail reception followed by a three course dinner inclusive of beverages followed by the awards ceremony. Sport 360 is responsible for facilitating the event only. 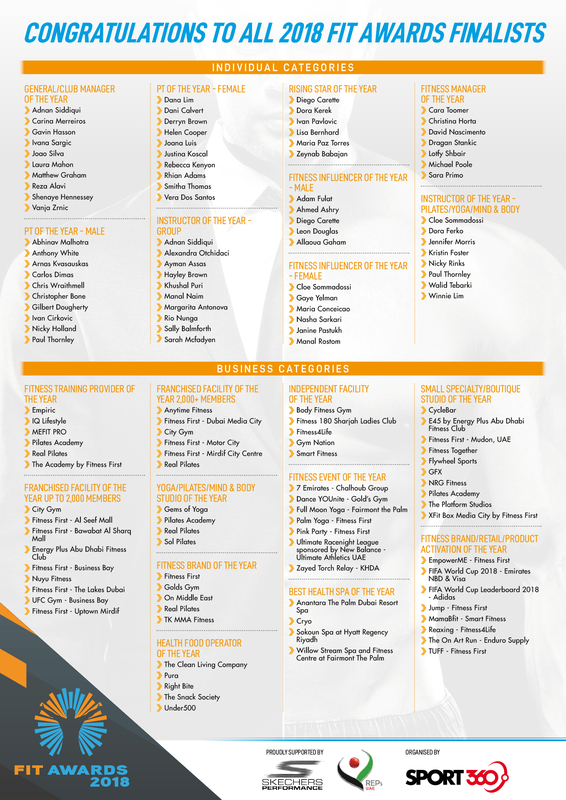 The nominee shortlists have been provided by the Judging Panel, made up of noted industry experts.